You need a bumper that works as hard as you do. 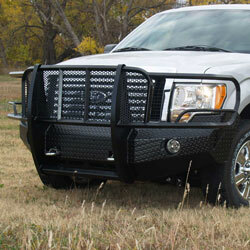 Learn more about the unmatched strength of Square Tube and durability of our truck bumpers. With a focus on strength and durability, our Full-Front Replacement gives you the utmost protection, while contouring to the body lines. We took our tough and durable premium front bumper shells to the next level with an aggressive light bar mount for an eye-catching look! Our products are specifically built for Emergency Responders and have the Strength and Durability to withstand the harshest conditions!